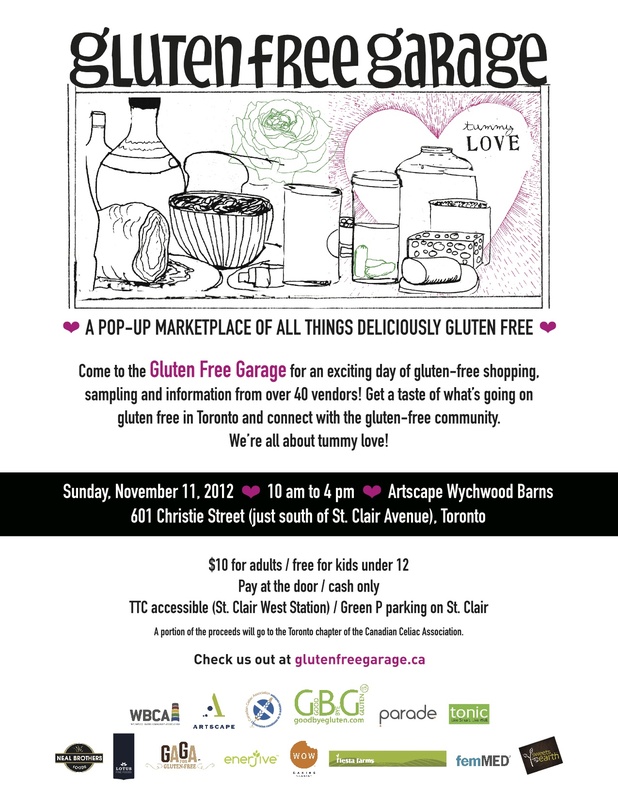 TORONTO, March 19, 2013 – Gluten Free Garage: The Sequel returns to Toronto’s Artscape Wychwood Barns on Sunday April 28th to kick off Celiac Awareness Month. This pop-up marketplace brings together more than 50 vendors to serve up the city’s best gluten-free fare—from sweets to savoury to skincare—along with food trucks (including Toronto’s own gluten-free meals on wheels, The Gourmet B1tches) and guest speakers. A 21st-century take on the farmers’ market with a gluten-free twist, the Gluten Free Garage (GFG) offers one-stop shopping and an opportunity to discover more about happy, healthy gluten-free living. With an estimated 1 in 133* Canadians living with celiac disease (an autoimmune disorder for which the only treatment is a strict gluten-free diet) and growing numbers of those with gluten intolerance and sensitivity, the demand for gluten free has never been greater. Also, more and more people are now eliminating gluten from their diets by choice. A recent survey from consumer research firm NPD Group revealed that nearly 30% of adults are interested in avoiding or cutting down on gluten. Alexandra Anca is one of five guest speakers at the Gluten Free Garage. The other guest speakers are: Chef, nutritionist and leading gluten-free expert Kathy Smart, bloggers Ricki Heller and Maggie Savage and naturopathic doctor Jodi Larry. They will be speaking on a variety of topics related to healthy gluten-free living. Learn from a handful of guest speakers on a variety of topics related to healthy gluten-free living. ABOUT GLUTEN FREE GARAGE: The wildly successful Gluten Free Garage launched last year as Toronto’s first pop-up gluten-free marketplace. 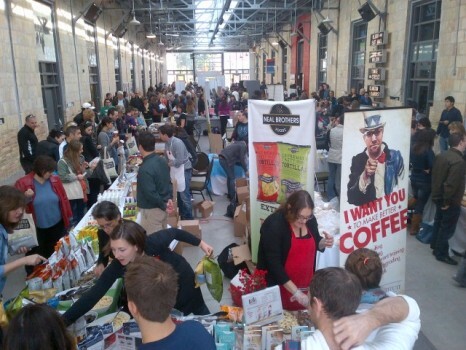 On November 11, 2012, 1,500 people flocked to the Artscape Wychwood Barns to discover, sample and buy gluten-free food and lifestyle products from 50 mostly local vendors. 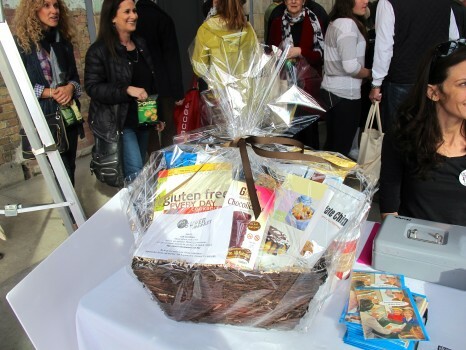 The GFG provides a venue to share gluten-free finds and better access to gluten-free products in order to help people with celiac disease and gluten intolerance live a happy and healthy gluten-free lifestyle. Sponsors of the Gluten Free Garage include: Fiesta Farms, Glutino, JK Gourmet, Hero Certified Burgers, Neal Brothers, Enerjive, GaGa for Gluten-Free, Late July, Lotus Fine Foods, Udi’s and Tonic. For photos, testimonials and more information visit Gluten Free Garage. A portion of the proceeds will go to the Canadian Celiac Association. Gluten Free Garage, the sequel! GFG 2012: We were feeling the g-free tummy love! If you were one of the 1,500 patrons who flocked to the Gluten Free Garage on November 11, 2012, you’ll be happy to hear that many of your favourite vendors will be returning to our upcoming pop-up marketplace with the products you love and trust. And we’re sure you’ll be excited to meet the fantastic new exhibitors who will be joining us this time! If you missed the inaugural Gluten Free Garage, we hope to see you on April 28th! With 50+ vendors, fresh gluten-free food prepared onsite, guest speakers, free tote bags and more, we’ve got a lot in store for you! Check out some more photographs from GFG 2012 here and read testimonials from happy sponsors, vendors and attendees here. Stay tuned for more information and updates about our upcoming event…it’s just around the corner! Many thanks to everyone who came out to the Gluten Free Garage! And congrats to Grace H. and Cristina G., the lucky winners of our 2 amazing door prizes! Posted in GFG updates, Tummy love.